When pigs fly, they have jets! The Jet Pig sports a helmet and a black jet pack. 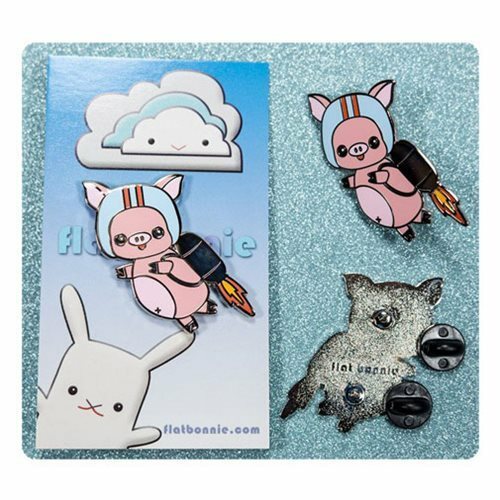 The Jet Pig Enamel Pin features a high quality Cloisonné style in which the design is separated by strips of flattened wire placed on edgeways on a metal backing. The enamel pin has a smooth, glass like surface and comes in a fitted clear plastic bag. The pin measures 1 1/2-inches long and has 2 pin post and 2 black rubber clutches. Falt Bonnie helps raise awareness of abandoned animals, and the importance of adopting when you are ready for a new friend. A portion of sales is donated to bunny/animal rescue organizations. Ages 14 and up.